The carotid body is a chemoreceptor organ buried posteriorly in the adventitia of the common carotid artery bifurcation. It is originated from the mesodermal elements of the third arch artery and the neural crest ectoderm. The carotid body is involved with the chemoreceptor control of blood pressure, heart rate and respiration. It detects changes in the composition of arterial blood flowing through it, mainly the partial pressure of oxygen (PO 2 ), but also of partial pressure of carbon dioxide (PCO 2 ). Furthermore, it is also sensitive to changes in pH and temperature. Paragangliomas are uncommon neoplasms of the head and neck that arise from the neural crest cells. 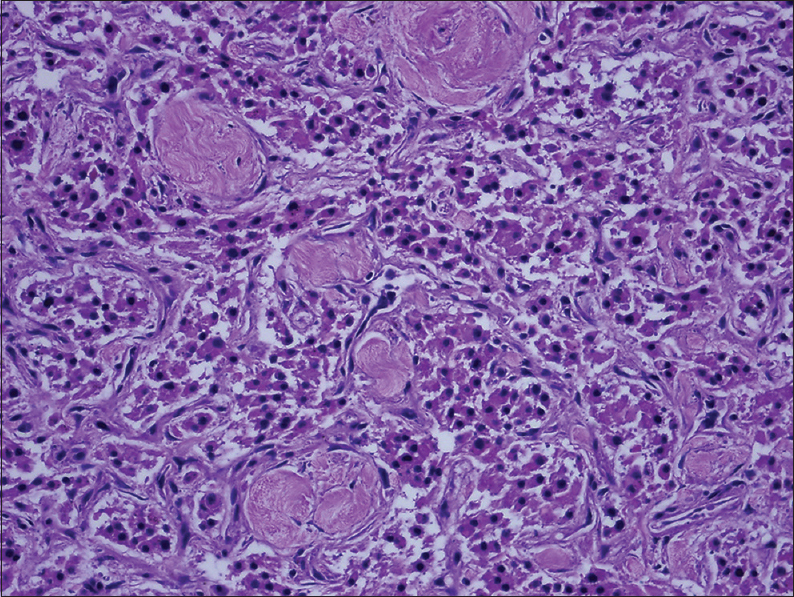 Histopathologically similar to the pheochromocytoma; it is usually benign and non-functional. Carotid body tumor is the most common form of paragangliomas of the head and neck area. The association of carotid body tumors (CBTs) with high altitude habitation and chronic hypoxemia has been documented. ,, Recent literature has proposed the development of CBTs as a response to the chronic hypoxia in patients with cyanotic congenital heart disease. , This present case demonstrates and discusses such an occurrence. A 20-year-old woman living at high altitude (1700 m) was referred to our hospital with cyanosis and a right neck mass. She was neither hypertensive nor diabetic and did not have any family history of paraganglioma. A right neck mass had been discovered for 2 years. Physical examination revealed a cyanotic woman without clubbing of the fingers and toes. In the neck, there was about 1.5 mm × 1.0 mm pulsatile mass. The jugular veins were distended. Auscultation detected a harsh grade III/VI midsystolic murmur at the left upper sternal border that did not radiate to the neck. The liver was slightly enlarged. The laboratory data included; hematocrit: 50%, PO 2 : 75 mmHg, PCO 2 : 35 mmHg, pH: 7.42 (pH; minus the decimal logarithm of the hydrogen ion activity). The highest PO 2 recorded was 83 mmHg. The erythrocyte sedimentation rate was 27 mm/h. Glucose, urea, creatinine, electrolytes, thyroid function tests with autoantibodies and 24 h urinary metanephrines, vanillylmandelic acid and 131 I meta-iodobenzylguanidine scintigraphy were normal. Chest X-ray showed a cardiac enlargement and diminished pulmonary vascular markings. The surface electrocardiography showed the right ventricular hypertrophy. Transthoracic echocardiographic and cardiac catheterization evaluation revealed Tetralogy of Fallot (TOF) (A large perimembranous ventricular septal defect, severe right ventricular outflow obstruction (systolic gradient 206 mmHg), right ventricular hypertrophy and overriding of the aorta). Ejection fraction (%) was 65%. Coronary angiography was normal. 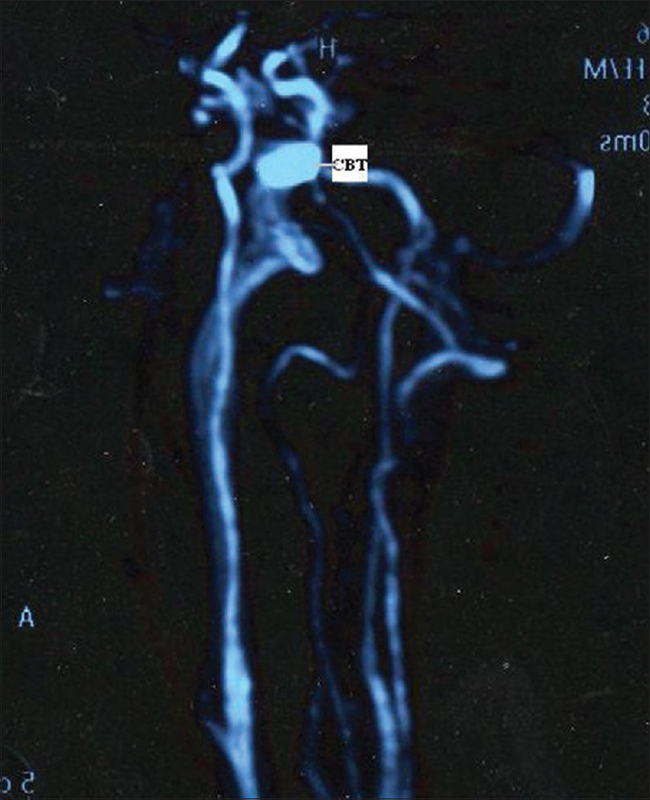 Magnetic resonance imaging showed a 16 mm × 10 mm hyperintense mass in the right carotid artery bifurcation [Figure 1]. Prior to the surgery, patient received an alpha blockade treatment for 2 weeks time. She underwent simultaneously successful surgical resection of the tumor and complete repair of the TOF (consists of patch closure of the ventricular septal defect and widening of the right ventricular outflow tract; systolic gradient decreased from 206 mmHg to 30 mmHg) after preoperative alpha receptor blockade for 2 weeks. Macroscopy and histopathology (with H and E stain) was consistent with carotid body tumor and it is composed of nest of epitheliod cells with granular eosinophilic cytoplasm, separated by trabeculated vascularized connective tissue [Figure 2]a, b, and [Figure 3]. The patient was discharged home in a week time without any complications. The patient was closely followed for the likelihood of local recurrences. The association of CBTs and TOF makes interesting speculation regarding pathophysiology. The carotid body is known to be involved in the regulation of blood pressure, heart rate and respiration. The carotid body, as a chemoreceptor, responds to PO 2 via response of type I (glomus) cells to the stimulus and triggers an action potential in the carotid sinus nerve, which is an afferent nerve fiber. The carotid sinus nerve relays the information to the central nervous system. The carotid body also senses changes in the arterial pH and PCO 2 but to a lesser extent than PO 2 . The carotid body is very sensitive to PO 2 levels in the blood; when the PO 2 is below 100 mmHg than the activity of type I cells increases rapidly. The type I cells in the carotid are derived from neuroectoderm and are thus electrically excitable. A decrease in PO 2 , an increase in PCO 2 and a decrease in arterial pH can all cause depolarization of the cell membrane and the effect is produced by blocking potassium currents. This reduction in the membrane potential opens voltage-gated calcium channels that cause a rise in intracellular calcium concentration. This causes exocytosis of vesicles containing a variety of neurotransmitters such as acetylcholine, dopamine, adenosine, noradrenaline and substance P. , The feedback from the carotid body is produced as an action potential and it is sent to the cardiorespiratory centers in the medulla oblongata through the afferent branches of the glossopharyngeal nerve. These centers, in turn, regulate respiration and blood pressure. All of these events causes increased firing of the chemoreceptors and subsequently lead to the development of increased ventilation rate, increased peripheral vascular resistance and possibly tachycardia. Recent studies have pointed out to a direct correlation between increased carotid body size and an increased right ventricular weight with a possible cause of hypoxia as the pathophysiologic basis for the enlargement of the carotid body size. , Nissenblatt  described the development of a CBT in a 28-year-old woman with hypoplastic right heart syndrome and suggested that the high altitude habitation induces hyperplasia of the CBT. In TOF, the ventricular septal defect is typically large; thus, systolic pressures in the right and left ventricles are the same. Pathophysiology depends on the degree of right ventricular outflow obstruction. A mild obstruction may produce a left-to-right shunt through the ventricular septal defect; however, a severe obstruction, as in our case, produces a right-to-left shunt, resulting in low systemic arterial saturation. This hypoxia may cause the development of hyperplasia of the carotid body or a tumor. In patients with congenital cyanotic heart diseases, the carotid body may enlarge due to hypoxia. This may be caused by right to left shunts or inadequate blood flow to the lung parenchyma. 1. Gonzalez C, Almaraz L, Obeso A, Rigual R. Carotid body chemoreceptors: From natural stimuli to sensory discharges. Physiol Rev 1994;74:829-98. 2. Shamblin WR, ReMine WH, Sheps SG, Harrison EG Jr. Carotid body tumor (chemodectoma). Clinicopathologic analysis of ninety cases. Am J Surg 1971;122:732-9. 3. Rodríguez-Cuevas S, López-Garza J, Labastida-Almendaro S. Carotid body tumors in inhabitants of altitudes higher than 2000 meters above sea level. Head Neck 1998;20:374-8. 4. Nissenblatt MJ. Cyanotic heart disease: "Low altitude" risk for carotid body tumor? Johns Hopkins Med J 1978;142:18-22. 5. Hirsch JH, Killien FC, Troupin RH. 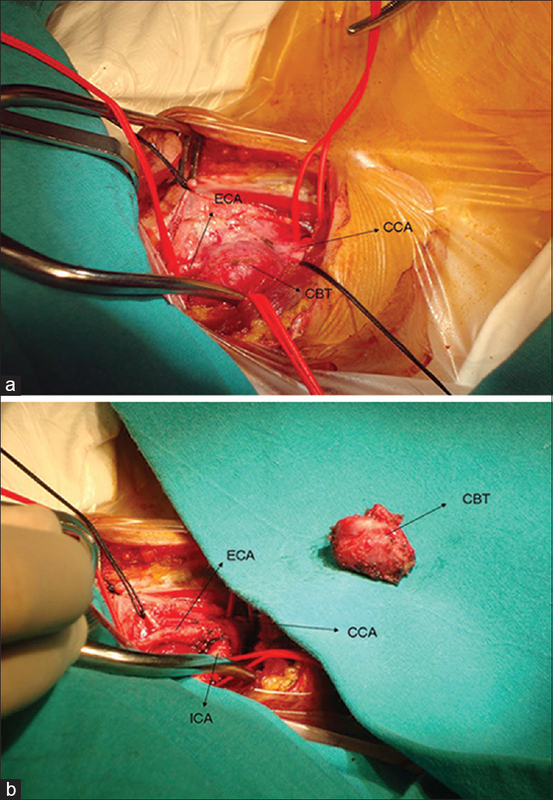 Bilateral carotid body tumors and cyanotic heart disease. AJR Am J Roentgenol 1980;134:1073-5.